Every year I go through different flavor phases. Once I get started on a particular one it is hard to quit. Last year I was all about the peppermint treats. 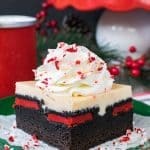 I was looking back at some of the recipes from last December, and almost everything I made had peppermint in it somehow. This year I’m loving eggnog. I have so many ideas running through my head using the creamy holiday nog. The problem is that there are not enough days to share all the fun holiday treats I want to make. 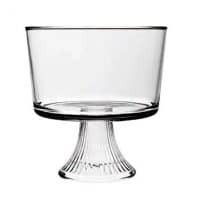 Maybe I should take eggnog off my shopping list because there is no way I will get to all the recipes in time. Or I can buy it, and let the boys drink it all. Usually I buy a carton at a time and limit them to one or two glasses each time because I need it for baking. Eggnog that is free to drink any time of day will make them so excited. You should see the big glasses they pour and drink. I can only handle a little bit at a time. This month I am partnering with the American Dairy Association Mideast with a recipe packed with dairy goodness and a way to help donate milk. Nutritionist recommend 3 servings of dairy a day. Children need the 9 essential vitamins that dairy provides to grow strong and healthy, but there are so many families across the country who do not know when or where they will get their next meal or gallon of milk. Even though milk is most requested at food banks all the time, it is one of the least donated items. A $5 donation will provide a family in need with milk to drink this holiday. Visit the Great American Milk Drive for more details on how to donate. Another way to help is to follow the American Dairy Association on their social media channels. For every new follower, they will donate 25 cents to the milk drive. Let’s all join together to help provide milk for those families in need. 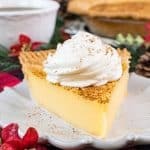 Adding dairy to your holiday baking is easier than you think, and it’s a great way to ensure your family is getting their servings of dairy each day. Using milk in baking helps to add sweetness to recipes and is used to get the golden brown color in some cookies and pastries. 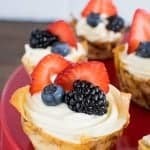 I also love to add Greek yogurt in place of sour cream in pasta dishes or cheesecake. Swapping out a healthier ingredient means I can snack on more holiday treats, right? As I was trying to decide on a holiday recipe that would be easy for this busy season, I just knew I had to make something with eggnog. After all, that’s my current flavor crush of the month. 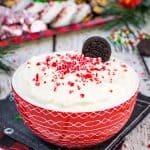 I decided to change up this peppermint brownie trifle and mix the eggnog with a pudding mix, cream cheese and home made whipped cream. 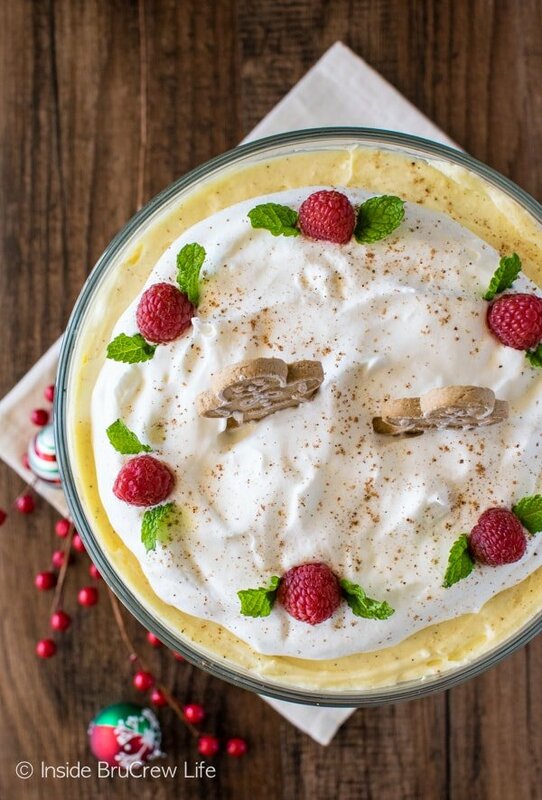 Three times the dairy totally make this no bake eggnog cheesecake trifle healthy, right? 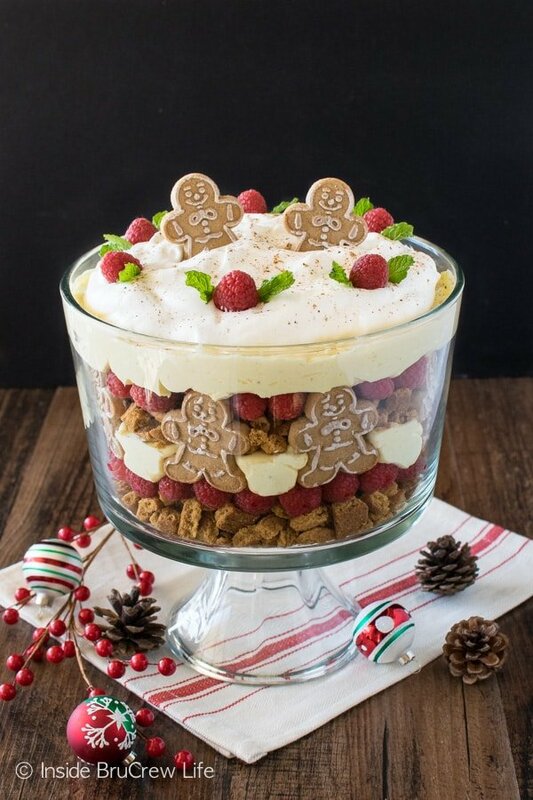 Layers of creamy cheesecake, chopped gingersnaps and fresh raspberries creates a delicious trifle. 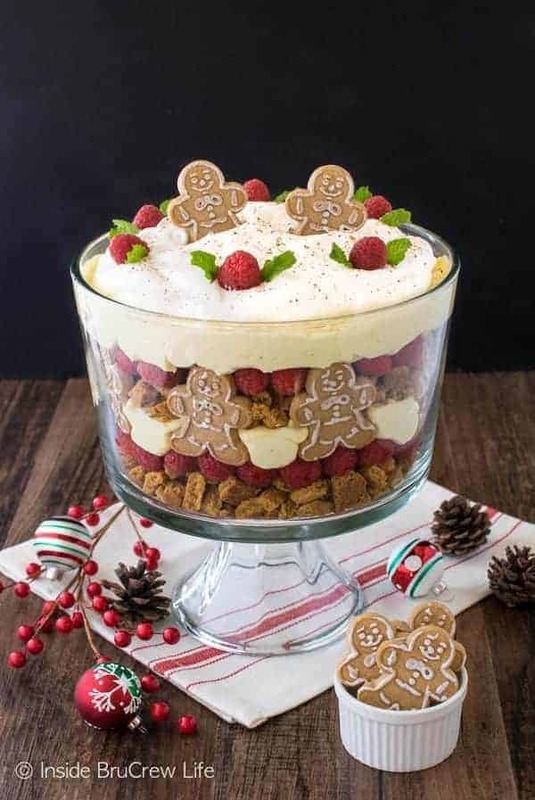 For some fun I also added some little ginger bread boy cookies around the bowl and on top. 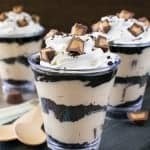 This easy dessert will stop everyone in their tracks! Drop the cream cheese into the mixing bowl and beat until creamy. Slowly add the chilled pudding to the cream cheese and beat again. Stir in the extract and nutmeg. Fold in half of the prepared whipped cream gently. 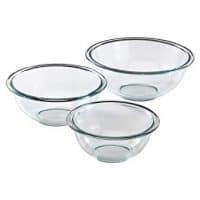 Layer half the chopped cookies in the bottom of a trifle bowl. Top with half the raspberries. Place 8 gingerbread boy cookies standing up around the outside of the bowl. Gently spoon in half the eggnog mixture. Use a spoon to spread it out evenly. Repeat with the remaining cookies, berries, and eggnog cheesecake. Add the remaining whipped cream to the top of the layers. Top with raspberries, mint leaves, and gingerbread boy cookies. Refrigerate until ready to serve. Best served within 1 day of making it. *ADA Mideast compensated me for my time creating a holiday dairy recipe and participating in the #GiveGallons campaign. All opinions expressed are 100% my own. This is such a festive looking dessert. I love your creativity! Pinned this to try it!!! YUM! This looks so gorgeously delicious! 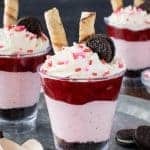 What a yummy, festive dessert!! 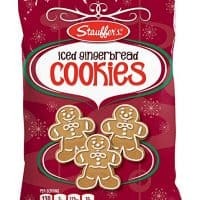 Gingerbread is one of my favorites this year, and I know this one will bring huge satisfied smiles. Thank you for another amazing recipe!! And, egg nog is always a favorite. 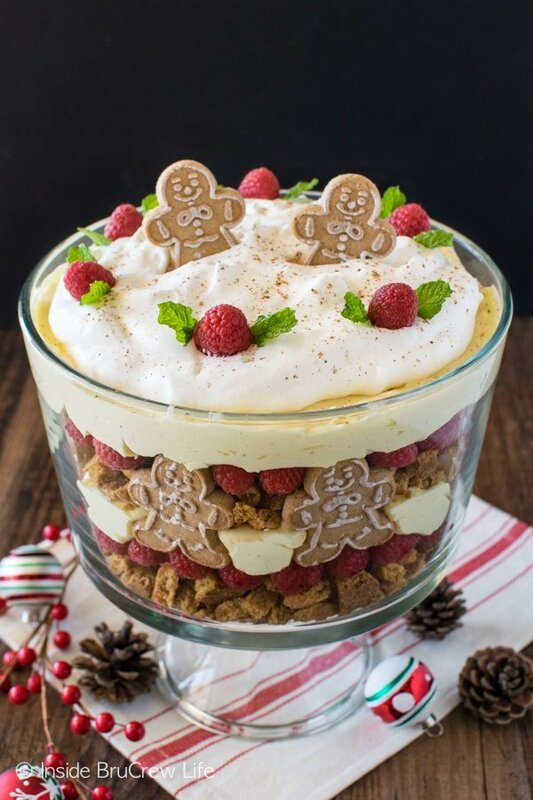 Really, no bake eggnog cheese cake trifle? Yummy,,perfect treat for the new year. Made it today for a church event….BIG hit!!! It tasted great!!! That’s awesome to hear! I’m so glad everyone loved it!! !